NAIROBI, Kenya - The U.S. Embassy is warning that an imminent terrorist attack in Kenya is possible. The warning said likely targets include places that foreigners congregate, including shopping malls and night clubs. The embassy issued the warning from what it called credible information. The U.S. did not specify who might carry out such an attack, but the warning comes a week after Kenyan troops pushed into Somalia to attack al-Shabab militants, blamed for a string of kidnappings on Kenyan soil. In response to the Kenyan military incursion, al-Shabab on Monday threatened to carry out suicide attacks in Kenya similar to those in July that killed 76 people watching the World Cup final in Uganda. Al-Shabab said that attack was a response to Uganda sending troops to support Somalia's government. Somali gunmen have kidnapped four Europeans in the last six weeks  two from the Lamu coastal region and two from the Dadaab refugee camp. One of the hostages, a quadriplegic French woman, died on Wednesday. On Saturday Kenyan troops in Somalia closed in on the rebel-held town of Afmadow where they may fight their first ground battle against al Qaeda-linked militants since launching an offensive last weekend, a military spokesman said. Hundreds of residents were fleeing Afmadow in anticipation of fighting as Kenyan and Somali troops moved closer. 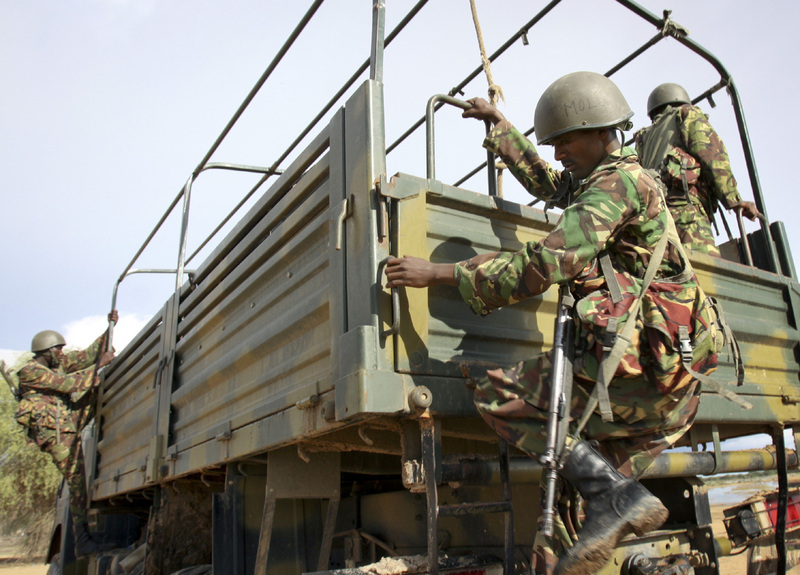 Maj. Emmanuel Chirchir said Kenya's army was flanking Somali troops and pro-government militia. Afmadow is now controlled by al-Shabab, Somalia's most dangerous militant group waging a war against the country's weak U.N.-backed government. "We believe this movement will create the first ground offensive," Chirchir said. Kenya had been bombing militants from the air but the charge at Afmedow will be first "man-to-man fighting situation," he said. Al-Shabab militants are regrouping in the town of Bula Haji to reinforce their fighters in Afmadow, Chirchir said. Osman Ahmed, a resident in Afmadow, said there is a lot of tension with militants preparing to do battle with Kenyan and Somali government troops. "We sleep and wake up with fears, only gunmen and sporadic civilians are crossing the streets. It's a frightening situation," he said. Somalia has been a failed state for more than 20 years. The lawless country is a haven for pirates and international terrorists and the conflict is causing a major famine which is believed to have cost tens of thousands of lives already. Al-Shabab is blocking aid from reaching hungry Somalis, after it banned major aid groups from operating in the territories it controls.